The subreddit /r/news has long been criticized in the Reddit community for its perceived bias. Typically, these accusations concern moderators’ censorship of anything that does not conform to their liberal worldview. The moderators of /r/news are certainly liberal with their policy of deleting posts and comments, justifying these actions by referring to their detailed list of rules. But many redditors argue that /r/news mods selectively interpret the rules, and are more likely to delete posts and comments that they simply disagree with. In the aftermath of the tragic Orlando nightclub shooting that targeted LGBTQ individuals, particularly those of latinx descent, these criticisms boiled over and transformed into a site-wide scandal that helps reveal a great deal about the site and its user base. On the morning of Sunday, June 12th, many users flocked to /r/news to read and post articles reporting on the shooting. Users quickly began expressing concerns about mass deletions of posts and comments, including fairly neutral articles about the victim count and donating blood. According to mod /u/hoosakiwi, “/r/news was brigaded by multiple subreddits shortly after the news broke. This resulted in threads being filled with hate speech, vitriol, and vote manipulation.” To address these concerns, the mods created a megathread where users could aggregate information about the incident and leave feedback for the mods. Nonetheless, the megathread was riddled with removed comments. Users were asking why everything was being deleted, stating that the entire subreddit is a disgrace, and accusing mods of deleting posts that mentioned the shooter’s alleged connection to ISIS. You can read the entire thread, including the removed comments here. /u/RNews_Mod responded to these complaints and allegations by saying “Only comments breaking our rules are being deleted. 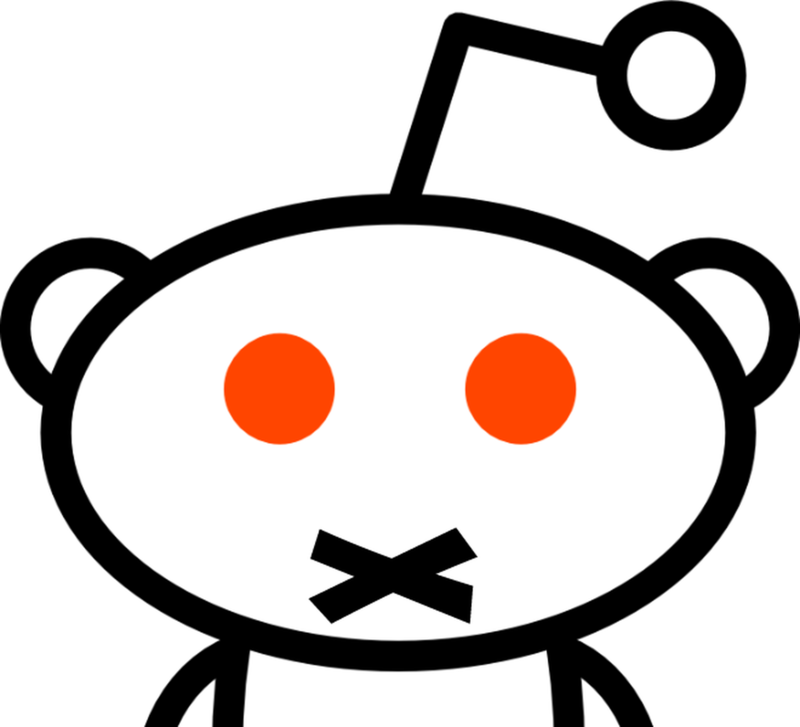 If you think its more productive to cry about censorship then it is to discuss this horrifying event, we suggest you try another subreddit.” And that is exactly what many users did. In a fairly unprecedented move, the /r/askreddit mods created a megathread for discussion of the event, which featured very few deletions and a great deal of links to news articles. For many users, the fact that the conversation on /r/askreddit contained significantly more useful information than /r/news demonstrated just how broken /r/news’ moderation system has become. But even more infuriating was the fact that most of the front page posts on the incident were on /r/the_donald, a subreddit devoted to Donald Trump supporters. Users were outraged that they first heard about the incident through /r/the_donald, rather than /r/news. They were asking others about a real news subreddit, without the heavy handed moderation that had botched this reporting. And thus, the door was opened for the subreddit /r/uncensorednews to take the stage. In the 3 years since its creation, /r/uncensorednews has seen very little subscriber growth. To be more specific, on June 10th, they had 20 subscribers. By the 12th, that number reached 65,941. At the time of this writing, the subscriber count sits at 83,196. You can see these metrics here. Few people knew much about the subreddit or its moderators; they were flocking there because of the name and the buzz surrounding the incident. Concerned about the content and moderator team on /r/uncensorednews, /u/rhiever analyzed the network of subreddits moderated by the /r/uncensorednews team. 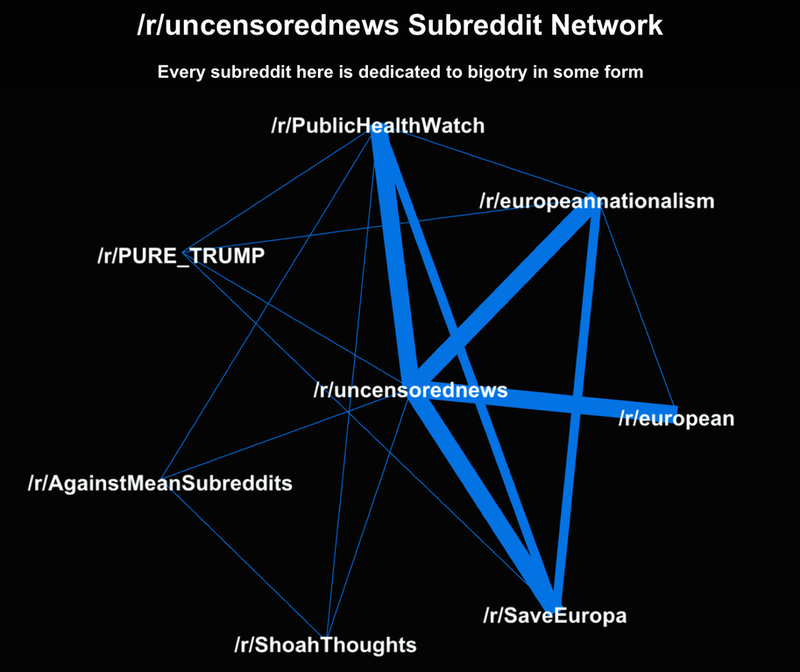 They found the strongest connections—subreddits that had more than 2 /r/uncensorednews mods in common, among /r/PublicHealthWatch, /r/europeannationalism, /r/European, and /r/SaveEuropa. I won’t go into a detailed analysis, but these subreddits spread white supremacist, homophobic, and transphobic bigotry. Every time a sub goes through an exodus, a hundred others crop up. People in Stormfront and similar groups pay attention and they try to catch the exodus. It’s like there’s an apartment building on fire, people are jumping from windows. And the KKK shows up outside their klan garb to catch folks as they fall. They’re not there because they feel bad about the people and want to help them. They’re hoping for some version of a Stockholm effect where the person who jumped ship is suddenly more trusting of the person who caught them, and more likely to listen to them in the future. It’s a recruitment tactic. And it’s been happening like clockwork for years here. If you’re unaware, go ahead and search “Reddit” on the Stormfront forums. You will see case after case after case of brigades being planned, subreddits targeted, strategies to use, lists of users to avoid, etc. This is what most on reddit don’t realize: the racism and hate message is absolutely organized. It is not just the way that “reddit is”, despite the fact that googling “Stormfront and Reddit” will show you blog post after blog post condemning reddit as the new home of racism on the internet. They target news subs. They target fringe groups. /r/european, /r/conspiracy, /r/worldnews – All primary targets, have been since 2013. They’re not interested in flame wars either. That’s not their MO. Their MO is copy/pasting the same cherry-picked ‘facts’ about their chosen target of hate. So when you see someone insinuate that reddit is just full of racists, take note: It’s not full of racists at all (edit: however they’re here, assuredly, just not the majority or even close to it). It’s targeted by them. Because it is quite the liberal den of bleeding hearts. And let’s be real: Those liberals do the same thing here. They preach, they evangelize their philosophy, they try to convince people and bring more to their side. Everyone does it. Especially to a group of 20-somethings who haven’t fully made up their minds. I’m not terribly interested in wading into the question of whether or not /r/news’ deletions were justified—it would take a great deal of digging through cached and archived graveyard threads to do any systematic content analysis of deletions and then make separate justifications for posts. What is interesting to me is the fact that allegations of censorship in a moment of extreme tragedy and high emotions brought a flood of users to a subreddit run by explicit racists and neo-Nazis. Responses to this revelation about the mod team varied. Some users were extremely disturbed and disappointed by the fact that both the leadership of and content within /r/uncensorednews was explicitly racist. Others didn’t seem to care at all, stating that they simply wanted a news aggregating site that allowed for complete freedom of opinion. But the ultimate irony is the slew of reports from redditors saying that /r/uncensorednews mods have already removed many comments and banned users that criticized their white supremacist connections. This story is so bizarre, so complex, so full of twists and turns, it merits a recap. Thousands, maybe millions, of Reddit users wake up on Sunday morning looking for news on the horrific Orlando shooting. They visit the front page of /r/all. The only subreddit they see reporting on the incident is /r/the_donald. They try to understand why /r/news has no posts. /r/news, a subreddit that is frequently flooded with vote brigading and bigotry, has apparently over-extended their moderation. This sends a massive influx of users to the newly-discussed /r/uncensorednews, who soon discover its racist leadership and content. Had the mods of /r/news been able to predict this outcome, would they have acted differently? I imagine so. The combination of the algorithmic force that propelled /r/the_donald posts to the top, the incredible difficulty mods have in monitoring and curating a massive flood of posts in a short period of time, and the opportunism of a few Reddit users looking for a means to promote their racist subreddit, made this entire debacle nearly unpredictable. Or perhaps, the mods of /r/news couldn’t have predicted it, but the mods of /r/uncensorednews certainly could, and did. It’s a good microcosm of our media landscape in general. News outlets report on mass shootings and encourage others to seek fame through violence. Journalists write about hate sites hoping to reveal their toxicity only to send even more traffic, and perhaps more devotees, to their front door. A public figure criticizes a racist tweet and experiences such severe blow back they are forced to recede from public life for a period of time. It’s overwhelmingly complex, and good intentions often don’t matter.